We buy junk cars for cash in Washington! We pay cash for junk cars in Washington and give instant offers up to $10,000! Washington state is beautiful, pristine, and majestic. So why ruin that by driving around with or keeping an ugly old junk car in your driveway? If your neighbors, wife, and dog have all been begging you to sell your junk car, it’s time to call The Clunker Junker. We pay cash for cars in Washington state and pick them up free, usually within a few business days. Once we buy your junk car, the family will be happy and you’ll have some extra cash to take them on a fun road trip through the Cascasde mountains in your new ride. Washington is well known for producing some of the greatest musicians to ever grace the charts. Jimi Hendrix, Nirvana, and Pearl Jam all hail from The Evergreen State. When you are looking to sell a junk car in Washington, The Clunker Junker’s cash for junk cars service will have you singing a sweet tune. Rather than deal with the crazies on Craigslist or get scammed by a Washington junk yard, we will pay top dollar for your junk car and provide you with the best customer service our industry can offer. From Seattle to Spokane, we buy more junk cars in Washington than any other car buyer. We know that Washingtonians are progressive and environmentally conscious. After all, it’s important to protect such natural wonders as Mount Rainer. That’s why we make sure all our Washington based junk car buyers follow environmental regulations and properly dispose of and recycle any cars that are dismantled. Selling your junk car in Washington doesn’t have to be hard – we’ll walk you through the process. In many cases we can have your junk car picked up within two or three business days and have even been known to pick up some vehicles on the same day. What kind of junk car are you selling? Knowing what kind of car we are buying is the first step to getting you an instant offer. Year, make, and model will be needed, and we'll ask some questions about the current condition of the vehicle as well. Money talks, and we always try and pay top dollar for cars in Washington. Our state of the art valuation software will take the information provided into account and figure out what your car is worth, instantly. You can choose to accept and we'll kick off our junk car removal process. This is our favorite part, where we get to put cash in your hand and tow your car away. Our junk car buyers are always professional and friendly, and we make sure they are legit before sending them out to you. No matter what you’ve got sitting out in the driveway, there’s a good chance we’ll take it and pay you cold hard cash for it. Take a look at what types of junkers we’ll take off your hands and what you can get for them. The most ocean-whipped piles of scrap are worth somewhere between $50 and $150. If you point at one of the garbage cars in the parking lot of the Mariners’ stadium, we probably won’t ask any questions. For the cars that still have some functioning parts, we’ll pony up between $100 and $200 depending on how serviceable the car is. The cars which are functional enough to drive but might be a bit unsightly could be worth up to $10,000 as far as we are concerned. We won’t ask you why you’re selling a perfectly good car for us, though! We have put together a simple guide and example for how to sign your Washington title when you are selling your vehicle. If there are multiple owners listed on the title, they must all sign the title unless the names are separated with "OR". 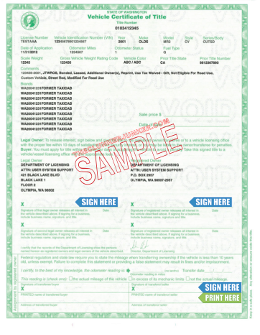 All signing and printing takes place on the front of a Washington state title and requires three signatures and one printed name. Make sure you don't print or sign anything on the back of the title. 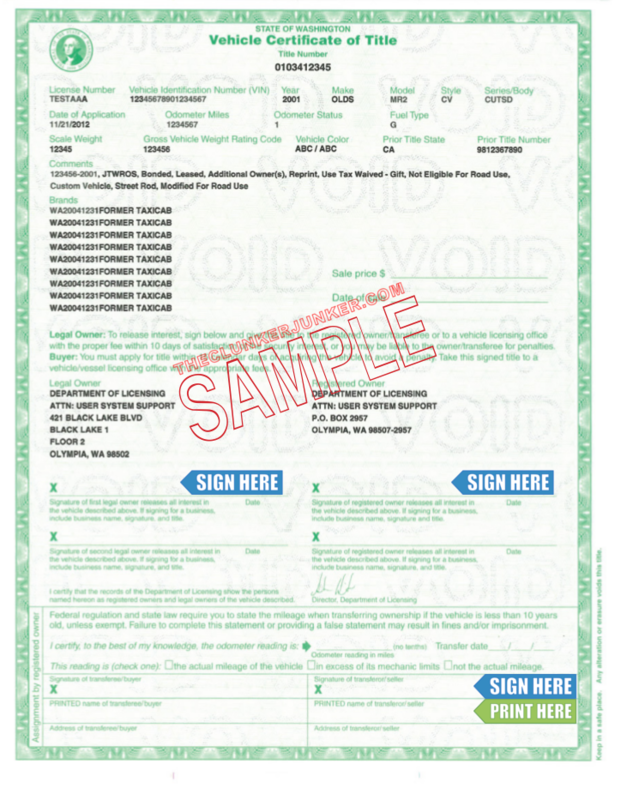 First sign the front of your title where it says "Signature of first legal owner releases all interest in the vehicle described above". Next sign the front of your title where it says "Signature of registered owner releases all interest in the vehicle described above". Then sign the front of the title in the section labeled "Assignment by registered owner" on the line that says "Signature of transferor/seller"
Finally, print your name on the front of the title where it says "PRINTED name of transferor/seller". 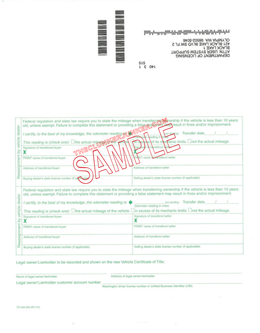 Fill out the Washington Affidavit of Loss form. 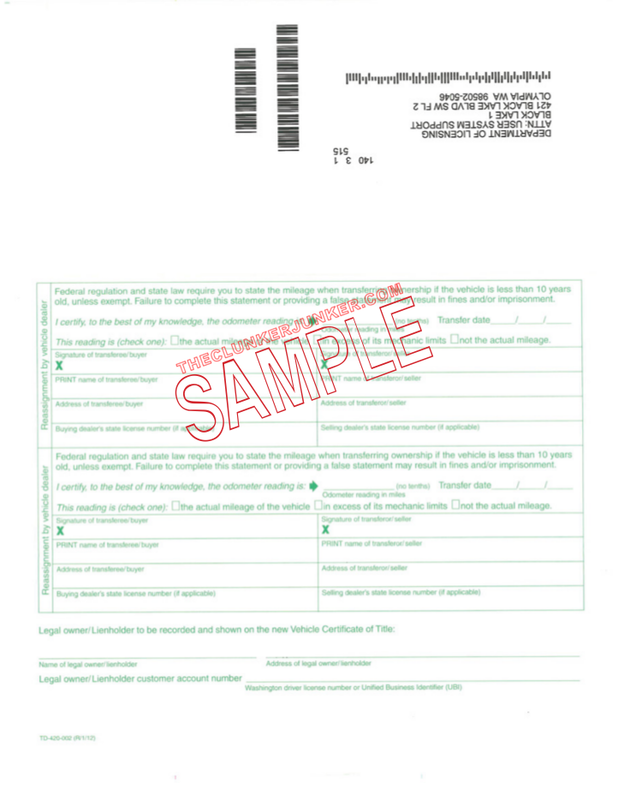 Bring your duplicate title application to your local vehicle licensing office or mail your application to your local vehicle licensing office or quick title office. Please note that there is a eight to ten week waiting period before a duplicate title can be issued and the cost is $19.00. "Quick Title" service is $69.00 and you will receive your new title in the same day. Getting rid of an abandoned vehicle in Washington can be a difficult process. Unfortunately, you cannot just sell any junk car that ends up on your property if you do not own it. You'll need to follow the Washington abandoned vehicle removal procedures. We have given a general overview of what that entails below. An officer may authorize the vehicle as abandoned and provide a Junk Vehicle Affidavit which may be used in lieu of title to have the vehicle removed from your property. To apply for the title to the vehicle, you must first have the vehicle removed by a tow service and wait for the vehicle to complete an Abandoned Vehicle Report (AVR), after which, the vehicle may be available through public auction or sale. Can you buy cars in Washington State without title? Under some circumstances, yes. However, we cannot purchase every vehicle without a title. There are certain restrictions based on age and location. At minimum you would need to produce a photo ID with a matching registration to prove that you legally own the vehicle. Sometimes buyers also require an affidavit in lieu of title as well. Washington often changes their title documents from year to year. If you have questions about your specific title, please contact your Washington DOL. Yes, unless you are transferring the plates to a new vehicle. You can return the plates to your local DOL office. You may need to notify your local DOL that you have sold the vehicle. You can contact them with any additional questions or concerns about the transfer of your title. We buy junk cars in Washington state and provide fast, easy service. Once your car is safely on its way to the junk yards, you’ll be glad you sold us your junk car for cash. Here at Clunker Junkers, we’re the experts at getting people the cash they want for the cars that they don’t want. Give us a call today, and we’ll get your clunker moving to the junk pile. "I will be removing the car stereo from the center console (it's a custom stereo). The battery is dead, but with a new battery, the engine will start and run with no issues. The car is driveable, but the catalytic converter broke at the weld, so it drags on the ground. " "I bought the vehicle from a friend, and they said I could use their plate, but I got a newer car and haven't switched anything into my name. The only part of the title that's filled out is the seller part, so the buyer part can still be filled in. " "The vehicle has a cylinder three misfire in the engine. It will start and everything runs smoothly except for Cylinder three which knocks because it's not igniting. The spark plugs need to be replaced, and one wire to the control box for Cylinder three. After that, this car would run perfectly fine. To a mechanic, this would be an easy fix." "The vehicle needs an O2 sensor, a windshield washer fluid tank and motor, part of the bumper and a button for the gas tank and the trunk. It's leaking steering fluid, and there's a problem with some ball joint on the front axle. It could be fixed and driven with a couple grand if someone wants a project. " "The vehicle does run, or at least it did two years ago when it was driven into our garage where it has sat ever since. There may be some frame rusting. It has one flat tire. I have a full, unmounted spare/replacement tire. " "The title is under my mom's name, but it is my car, and she will bring the title if you guys can offer a reasonable amount of cash. The cash I get from this Nissan is going into my new car." The Clunker Junker is one of the top junk car buyers in the state of Washington. To date we have made instant offers on over 40 thousand vehicles across the state, totaling over $10 Million offered! Of those vehicles, approximately 4% were purchased without a title. We also buy cars on a wide spectrum of conditions and 62% of the vehicles we've made offers on in Washington do not start or drive. Many also have moderate to severe body damage. Seattle in King County was our top producer, followed by Tacoma.